Reginald (Reggie) Dwayne Slater (born August 27, 1970, in Houston, Texas) is an American former professional basketball player. 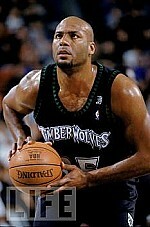 A 6'7" forward from the University of Wyoming, Slater was never drafted by an NBA team but did manage to play in 8 NBA seasons from 1994–1999 and 2000-2003. He played for the Denver Nuggets, Portland Trail Blazers, Dallas Mavericks, Toronto Raptors, Minnesota Timberwolves, New Jersey Nets and Atlanta Hawks. In his NBA career, Slater played in 259 games and scored a total of 1,450 points. His best year as a professional came during the 1997-98 NBA season as a member of the Raptors, appearing in 78 games and averaging 8.0 ppg.